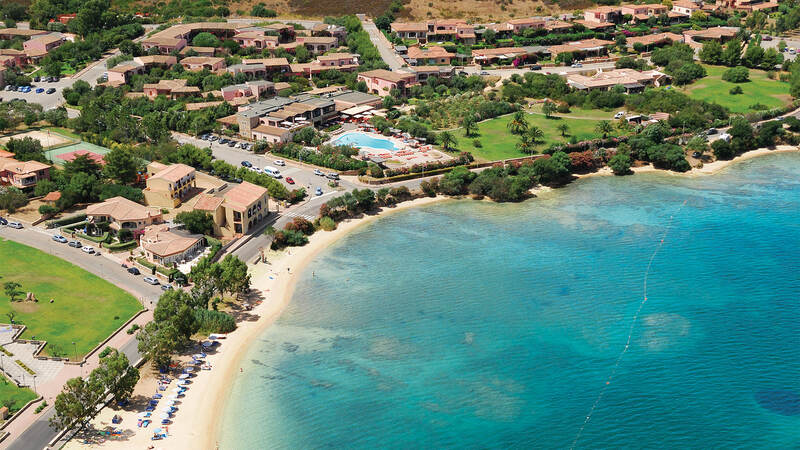 The Resort Cala di Falco looks out over the public beach at Cannigione in the North of Sardinia, a short distance from the famous Costa Smeralda. The North East coast of Sardinia is famous for its beaches of fine white sand, broken up at intervals by delightful little bays washed by crystal clear transparent water. The Resort Cala di Falco is the perfect destination for a holiday by the sea in the North of Sardinia because in just a few minutes by car or boat you can get to the most beautiful and transparent inlets along the Golfo di Arzachena coastline, the beaches of the Costa Smeralda or the uninhabited islands of the La Maddalena Archipelago and going as far as the Corsican archipelago and the town of Bonifacio. The public beach at Cannigione is right in front of the resort, a dozen or so metres from the swimming pool of the hotel, just over the road. Here guests staying with the formula hotel can take advantage of a free beach service offering parasols and sun loungers. The Resort Cala di Falco also offers a free shuttle bus service to the splendid public beach at Mannena with outside operator beach service to be paid for. This shuttle bus service is free for guests with formula hotel or staying in the villas (not available on Saturdays). The marina at Cannigione is an excellent base for heading off on sea excursions with Delphina’s own boats: every day a swim in a different paradise with the “Delphina Express” motorboat which sets out for the enchanting islands of the La Maddalena Archipelago or the best beaches along the Costa Smeralda at special rates reserved exclusively for Delphina guests. In addition there are exclusive full day mini-cruises with the historic sailing ship “Pulcinella” or fast motorboats with lunch on board for endless swims in the most enchanting little bays of the La Maddalena Archipelago, Isola Piana and Lavezzi. There is also the chance of charters and exciting fishing or whale watching trips with prestigious Poseidon boats. There is one large pool reserved for guests at the hotel provided with parasols, sun loungers and lifeguard service and a second one with sun loungers and deck chairs reserved to the residence guests.